Ridge Gourd Poppy Seeds Gravy. Ridge gourd is peeled and chopped. Poppy seeds are ground into powder. 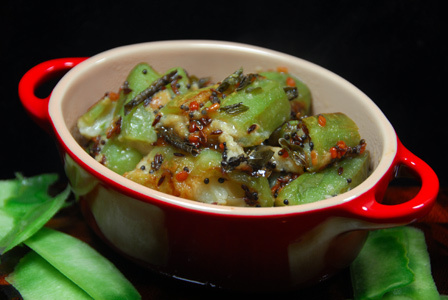 Ridge gourd is then cooked in poppy seeds onion gravy. Serve ridge gourd poppy seeds gravy with steamed rice. Makes: around 4 Servings of Ridge Gourd Poppy Seeds Gravy. Remove skin, wash and chop the ridge gourd into small chunks. Remove stems, wash and roughly chop the green chiles. Grind poppy seeds into fine powder using a spice grinder. Add the chopped onion and few tablespoons of water and grind again into smooth paste. When mustard seeds start spluttering, add chopped ridge gourd. Fry briefly, stir in ground onion poppy seeds paste, a cup of water and turmeric powder. Cook covered till ridge gourd turns soft. Uncover and boil till the mixture becomes little thick. Adjust any seasonings if required and garnish with cilantro and serve ridge gourd poppy seeds gravy with steamed rice. Notes: Make sure ridge gourd is cooked well. Variations: Check other ridge gourd recipes here. Other Names: Ridge Gourd Poppy Seeds Gravy. Cabbage is chopped and cooked in oil along with chopped onion. Poppy seeds are toasted and ground into powder along with coriander and cumin. The powder is then added to the cabbage curry as a finishing step. 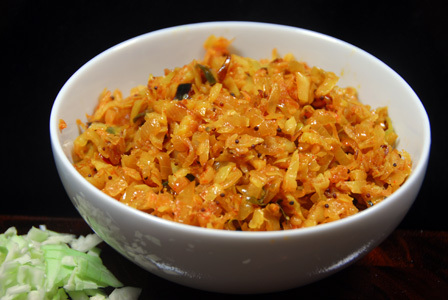 Serve cabbage poppy curry with steamed rice or with roti. Makes: around 4 Servings of Cabbage Poppy Curry. Remove outer leaves, wash and chop the cabbage. Heat a pan on low heat, add poppy seeds, coriander seeds and cumin seeds. Toast for a minute or until aromatic and remove from heat. Grind the poppy seeds mixture into fine powder and keep aside. When mustard seeds start spluttering, add sliced onion and ginger garlic paste. Fry for around few minutes on medium flame and stir in cabbage and turmeric powder. Fry for around 5 minutes or until cabbage is cooked. Stir in ground poppy seeds powder, red chili powder and salt. Cook for another minute and remove from heat. Serve cabbage poppy seeds curry with steamed rice or with roti. Notes: Make sure not burn any ingredients while toasting. Variations: Check other variations with cabbage here. Other Names: Cabbage Poppy Curry. Poppy seeds are soaked in water for couple of hours and ground into paste along with coconut. Bottle gourd is chopped up and cooked in the poppy seeds paste till done. 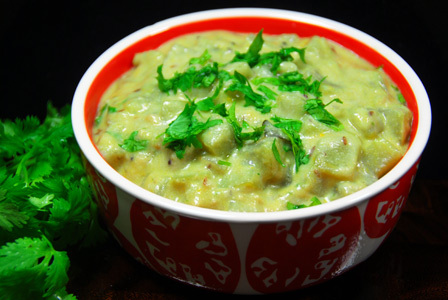 Serve bottle gourd in poppy seeds gravy with plain steamed rice, or with roti or chapathi. Makes: around 4 Servings of Bottle Gourd in Poppy Seeds Gravy. Peel, remove ends and chop the bottle gourd into small pieces. Pressure cook the bottle gourd with few splashes of water for 3 whistles. Soak poppy seeds in water for around 4 hours. Grind the soaked poppy seeds with grated coconut, green chiles, a pinch of cumin seeds and salt into smooth paste adding least amount of water. When cumin seeds change color, add cooked bottle gourd, tamarind, turmeric powder and salt if necessary. Stir for few seconds, add the poppy seeds coconut paste, reserved cooking liquid or quarter cup of water. Cook covered on low flame for around 5 minutes and remove from heat. 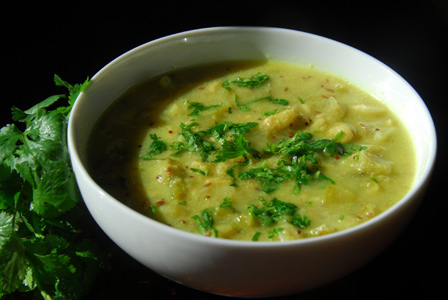 Garnish with cilantro and serve bottle gourd in poppy seeds gravy with plain steamed rice, or with roti or chapathi. Notes: Make sure bottle gourd is cooked well. Suggestions: Don’t overcook once the poppy seeds coconut mixture is added to the pan. Variations: You can also add chopped onion to the talimpu. Other Names: Bottle Gourd in Poppy Seeds Gravy, Sorakaya Gasagasala Kura. Poppy seeds are soaked in water for couple of hours and ground into paste along with coconut. The freshly made paste is stuffed into ridge gourd cylinders and cooked till soft along with whole spices. Serve poppy seeds stuffed ridge gourd with plain steamed rice, or with roti or chapathi. Makes: 5 pieces of Poppy Seeds Stuffed Ridge Gourd. Wash, remove ends, remove the skin and chop ridge gourd into 2 inch long cylinders. Slit the chopped ridge gourd making a plus sign with its bottom intact. Stuff the ridge gourd pieces with the prepared ground poppy seeds paste. Heat oil in a wide pan, add all talimpu ingredients in order. When cumin seeds change color, arrange the stuffed ridge gourd pieces. Cook covered for around 5 minutes until ridge gourd pieces turn soft. Turn the ridge gourd pieces occasionally and cook covered again till ridge gourd turns light brown on the sides. Uncover and fry for couple of seconds and remove from heat. 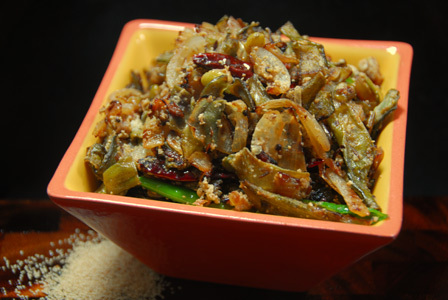 Serve poppy seeds stuffed ridge gourd with plain steamed rice, or with roti or chapathi. Notes:Make sure to scrape the bottom of the pan to avoid burning of the stuffing. Suggestions: If ridge gourd feels raw, put back in stove, sprinkle water and cook covered on low-medium flame till ridge gourd turns soft. Variations: Stuffed Ridge Gourd , Ridge Gourd with Milk, Ridge Gourd with Moong Dal. Other Names: Poppy Seeds Stuffed Ridge Gourd, Beerakaya Gasagasala Kura. Fresh beans are cooked in oil along with whole spices and onion. Poppy seeds are soaked for a good amount of time and ground into paste. The poppy seeds paste is added to the beans and briefly cooked. Serve beans with poppy seeds over plain steamed rice or with roti. Makes: around 4 Servings of Fresh Beans with Poppy Seeds. Soak poppy seeds in little bit of warm water for around 3 – 4 hours. Peel and roughly chop ginger. Grind poppy seeds, ginger and salt into smooth paste adding least amount of water. Wash, string the beans and halve them. Peel and halve the onion. Horizontally halve the halved onion and vertically slice it. When mustard seeds start spluttering, add sliced onion. Fry till onion turns translucent, add sliced beans and green chiles. Fry on medium flame till beans change color and onion is brown. Once beans are cooked, add poppy seeds paste and salt (if necessary). Cook on low flame for couple of minutes and remove from heat. Serve beans with poppy seeds over plain steamed rice or with roti. Notes: Make sure to soak poppy seeds well before grinding. Suggestions: If fresh beans are not cooked well, put it back on heat, add a splash of water and cook covered on low flame till done. Variations: You can also grind the green chiles with poppy seeds if desired. Other Names: Fresh Beans with Poppy Seeds, Chikkudukaya Gasagasala Vepudu.